Attendees at the Continuing Education and Workforce Development Healthcare recognition ceremony from left in bottom row are Daniel J. Carter, Bailey Cantrell, Abigail M. Dodato, Deanna M. Jones, Karlie M. Knott, Caley Landrum, Suzanne L. Lucero, and Julie N. Pham. Appearing in the top row from left are Eileen J. Radtke, Tabitha Rea, Sophia Rice, Danielle Sikorski, Karen Tippett-Dillon, Jalynn A. Cristaudo, Ashley Freeman, Bryce G. Jones, Angela L. Scott, and Shaunda C. Wentz. New traditions were forged in December at the College of Southern Maryland. The school held its first recognition and pinning ceremony for students who had completed parts of the Continuing Education and Workforce Development Healthcare programs. 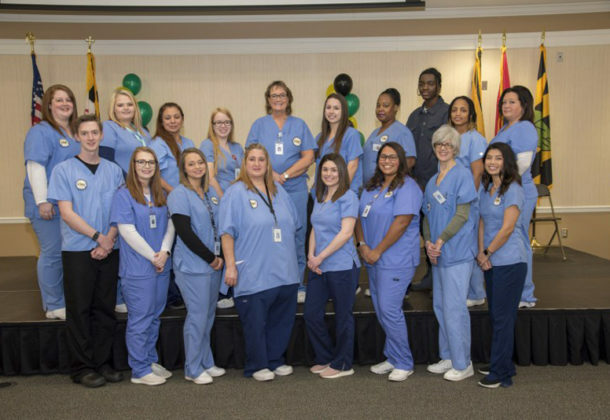 Students who received certifications to become clinical medical assistants, nursing assistants, dental assistants, geriatric nursing assistants, electrocardiogram technicians, or phlebotomy technicians were celebrated at the event. Dr. Dan Mosser, CSM Vice President of Continuing Education and Workforce Development, told the students that there is no better time to work in health care. “The US will need to hire 2.3 million new health care workers by 2025 in order to adequately take care of its aging population, and according to research by global health care staffing consultancy Mercer, a persistent shortage of skilled healthcare workers translates into hundreds of thousands of positions that remain unfilled. “The College of Southern Maryland is fortunate to have dedicated staff and adjunct healthcare faculty working with our students to help them achieve success,” said CSM Healthcare Program Director Lori Proctor. She went on to recognize CSM instructors Dr. Marvin Becker, Connie Conner, Brenda Gentles, Jennean Hodge, William Rush, Darlene Rush, Jamie Smith, Cindy Summers, TiKeya Williams, and Brenda Wilson. Before she recognized the completers with their healthcare pins, CSM Healthcare Course Manager Jill Lassiter said a thank you the clinical partners across Southern Maryland who play vital roles as trainers and employers of CSM’s healthcare program participants. “As you can imagine, there are many partners involved to help make our program a reality and I would like to take a moment to recognize their support,” she shared before pointing to Calvert Health Systems, Genesis Healthcare Waldorf Center, Solomons Nursing Center, Labcorp, Sagepoint Nursing and Rehabilitation Center, DATS, and St. Mary’s Nursing Center Inc.
Samantha Alecknavage, Stefany Martinez, Oneyda P. Ortiz, and Crystal M. Street. Shelly M. Bridgett, Daniel J. Carter, Bailey Cantrell, Caitlin Demarr, Abigail M. Dodato, Melissa Flerlage, Gabriel T. Gonzales, Hannah E. Harms, Deanna M. Jones, Ashley N. Kackley, Karlie M. Knott, Caley Landrum, Suzanne L. Lucero, Dipila Panday, Julie N. Pham, Eileen J. Radtke, Tabitha Rea, Sophia Rice, Rupali P. Shah, Danielle Sikorski, Karen Tippett-Dillon, Edelyn Y. Valencia, and Jade C. Wilson. Cali R. Brett, Jasmine Brockington, MacKenzie K. Clark, Crystal C. Cavanaugh, Jalynn A. Cristaudo, Angela E. Garner, Carmelia B. Johnson, Kemarmi Jones, Karen A. Laperch, Katherine Murphy, Taylor A Peterman, Lauryn N. Stancil, and William Strong. Brianna N. Rackey and Alexis K. Reid. Ashely Freeman, Kaitlyn T. Hall, Saki N. Hilario, Bryce G. Jones, Sahrai L. Mendiola, Michelle A. Routt, Angela L. Scott, Shaunda C. Wentz, April Y. Whiting, and Orchid Wilkes. For information about CSM’s healthcare programs, visit the college online. Check out photographs of CSM’s Continuing Education and Workforce Development Healthcare recognition and pinning ceremony on the college’s photo sharing site.